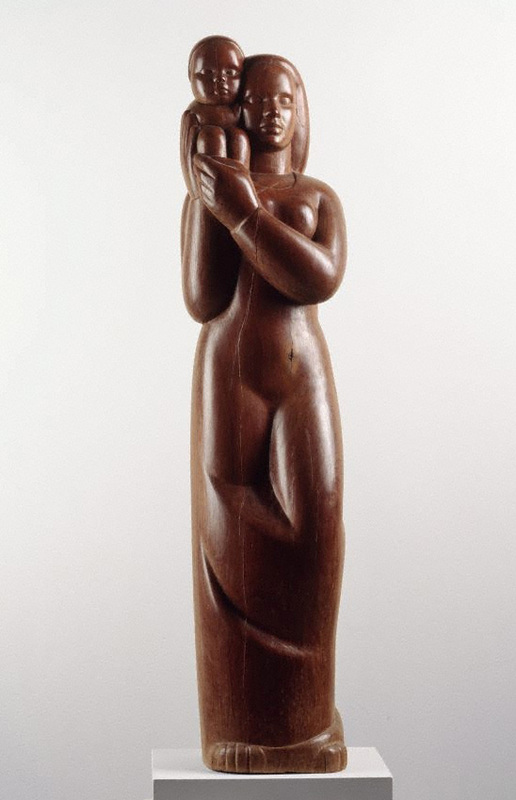 Arriving from the United States in 1934 with her Australian partner, Frank Hinder, this prolific sculptor was well-versed in contemporary international developments in art. In Sydney she studied with Eleanore Lange, a German-born artist-teacher, and began experimenting with local timbers and stone. Mother and child shows how quickly she accommodated Australian materials, and a certain Australian robustness as well. Though strongly influenced by English sculpture of the interwar period, especially that of Henry Moore and Jacob Epstein, Hinder's truer inspiration came from her interest in vitalist philosophies and theories. The self-contained poise of this image soon gave way to a restlessness more resonant of modern times. The sculpture of Margel Hinder , 'List of illustrations', pg. 6-7, Willoughby, 2013, 6, 50, 53 (colour illus. ), 54, 62, 156. 19th & 20th century Fine Australian and International Art: Fine Art auction 20 & 21 August 2001 Melbourne , Melbourne, 2001, 112. lot no. 77, 'Man with Jackhammer', 1939, cedar relief, 62.5 x 54.5 x 3.5cm. Reference to 'Exhibition I' and Hinder's 'Mother and child' in the Gallery's collection. Deborah Edwards, Look , 'Margel Hinder's 'Mother and Child': A Major New Acquisition', pg. 14, 18., Heidelberg, Apr 1995, 14 (illus. ), 18. Deborah Edwards, Australian art: in the Art Gallery of New South Wales , 'Moderns', pg. 103-104, Sydney, 2000, 134 (colour illus. ), 301. Bruce James, Art Gallery of New South Wales handbook , 'Australian Collection: Painting and Sculpture', pg. 102-181, Sydney, 1999, 146 (colour illus.). Denise Mimmocchi, Sydney moderns: art for a new world , 'Towards the abstract: the art of Exhibition 1', pg. 270-271, Sydney, 2013, 270, 271 (colour illus. ), 314, 322. Natalie Wilson, Parallel visions: works from the Australian collection , 'Grace Crowley / Ralph Balson / Frank Hinder / Margel Hinder', pg. 88-103, Sydney, 2002, 92, 101 (colour illus. ), 144, 147.